The Mac version of the app has only ever been purchasable through the Mac App Store the update should be available in the updates tab of the Mac App Store. If it isn't showing please try logging out and then back into the Mac App Store to see if that makes it appear. and for windows? I mean.. should I download again affinity from my account of affinity design website and re install again the version 1.6? i guess will delete my assets..
because in the affinity program it's just say a new version is online, but doesen't say UPDATE. The Windows version of the app should ask you if you would like to download the latest update when you open it. If you have clicked ok to this message restarting the app will make it reappear. Your situation is a little different from "regular" users. I've forwarded your issue to the support dept. Someone should get back to you soon. A perfect solution would be a conversion to a normal Apple-Store Version. We are still looking into this. Can you confirm something for me please? Are you actually running the Mac or the Windows version? This is a specific situation that must be handled in a different way. Please give us a couple days to sort it out. We will get back to you next Monday or Thursday. Thank you for your patience and again sorry for the inconvenience this is causing you. Thank you for your patience and again sorry for the inconvenience this is causing. No problem. Thank you for your help. Do you have acquired Affinity Photo through the X-Rite promo? I bought both windows and mac product's directly from you with invoice to company. I've the same issue, I bought Affinity Designer for Mac per Email over the App Store and cant update. We are waiting for a solution. The other people in this thread did not buy in the Mac App Store (MAS), they bought through the Affinity Store http://affinity.store/ . 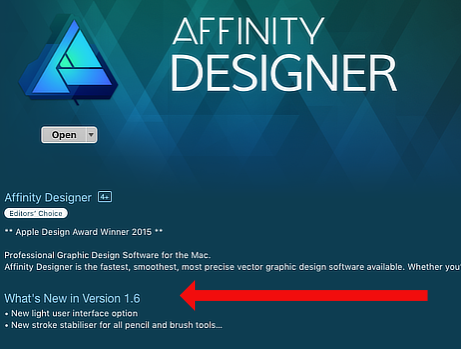 I've already tried, but i still see Affinity Designer macOS - Version 1.5.5 in the Affinity Store. You can’t buy the Mac versions directly from Serif. You can only buy them through the Mac App Store. If you purchased the Mac version of Affinity Designer, you need to go to the Mac App Store ("App Store..." on the Apple menu). The Affinity Store (https://affinity.store/) does not sell the Mac version nor can you get updates to it there. Go to the Updates tab to find it listed there, along with a download button. Alfred, do you want to make a bet? As I understand it, there are other ways for companies to buy multi-user licenses for the Mac versions, but it is not clear if the licenses for them would qualify for the free-for-now bonus content, or how the app updates for the Mac versions can be obtained. As I understand, the Xrite Promo purchasers are currently not able to update Affinity Photo and we will not get the free content. Deadline Nov 16th.